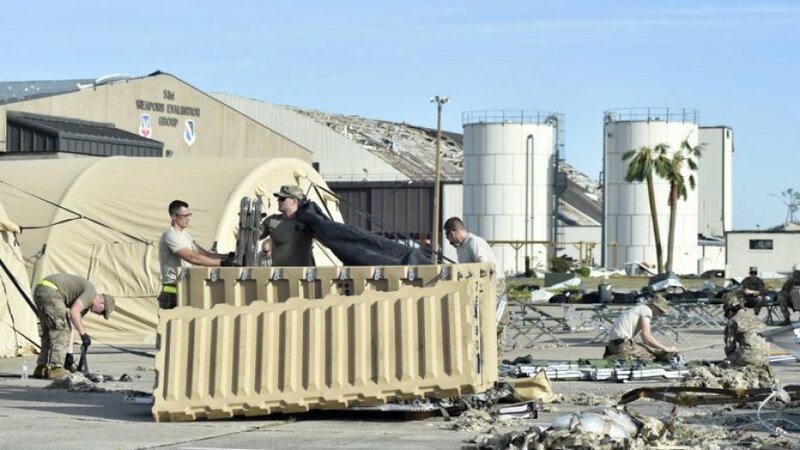 Tyndall Air Force Base will see the return of most of its missions within three months, the Air Force announced Friday, as the Florida base still recovers from damage left behind by Hurricane Michael. Nine of the 14 missions will be back at Tyndall within one to three months, according to a news release from Sen. Bill Nelson, D-Fla. All but 500 airmen will return to the base, the Air Force said. Tyndall, about 12 miles east of Panama City, took a direct hit from Hurricane Michael, a Category 4 storm, on Oct. 10. The base suffered significant damage to most of its buildings and infrastructure, including to roofs, downed power lines and trees. p class=”krttext”>Most of the bases’ estimated 55 F-22 Raptor aircraft were able to move to other bases before the storm — but several of them were damaged when they were left in hangars at the base because they were in various states of maintenance. Tyndall has been the main training site for the Air Force’s F-22 Raptors pilots. The F-22s from the 95th Fighter Squadron that were able to leave and their personnel will relocate and resume operations at three locations: Joint Base Langley-Eustis in Virginia, Joint Base Elmendorf-Richardson in Alaska, and Joint Base Pearl Harbor-Hickam in Hawaii. The aircraft were moved because of insufficient infrastructure at Tyndall to resume their operations, according to the Air Force. It has not been decided whether the F-22s will return to Tyndall permanently, Air Force Secretary Heather Wilson told reporters Friday in a conference call, Military.com reported. Other Tyndall units will move to Eglin Air Force Base in Florida, including the 43rd and 2nd Fighter Squadrons’ F-22 Fighter Training and T-38 Adversary Training units, as well as the 372nd Training Squadron, Detachment 4. The Noncommissioned Officer Academy will also temporarily disperse to four locations: McGhee-Tyson Air National Guard Base in Tennessee, Maxwell Air Force Base – Gunter Annex in Alabama, Keesler Air Force Base in Mississippi, and Sheppard Air Force Base in Texas. The Tyndall community is made up of about 11,000 active-duty personnel, civilians, and family members. The base’s 325th Fighter Wing also hosts more than 30 tenant organizations, according to its website.